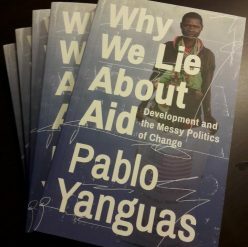 It’s been over 5 years since I started working on issues of development assistance, and yet I still get incensed when I see the polemics that periodically surface in public debate: “aid is dead!”, “no, we need more aid!”, “but aid experts are deluded planners!”, “even so, you should give at least 0.7%!”, and so on. It has taken me a while to come to the realization that this kind of crossfire annoys me because I tend to work on much more specific issues: what kind of aid can promote institutional reform? Or, what kind of donor can exact reform from a patrimonial government? This has led me to realize that aid debates take place on at least three different levels of analysis, each of them based on a different conception of what aid is: a macro resource, a meso strategy, or a micro tactic. And the peculiarities of each level have implications both for research and advocacy. At the macro level aid is conceived in terms of flows: inflows, outflows, in budget, off budget, tied or untied, percentage of GDP, percentage of government expenditures, and so on. Much of the debate about aid working or not working seems to take place at this level, which is also dominated by the ethical dilemmas surrounding giving and receiving assistance. Some people advocate 0.7% contributions, while others decry the fact that aid does not contribute to economic growth. This is the realm of the Bill Easterly‘s and Paul Collier‘s of the world, of political economists interested in the deleterious effects of aid as a non-tax revenue (in terms of democracy or state-building) or as a disruptor of local economies (in terms of market prices or poaching of talent from the civil service). For those interested in what aid organizations actually do, macro results are seldom useful except as framing devices: this different kind of question usually requires lowering one’s gaze down from the Platonic realm of numbers and into the messiness of government agencies and departments. Donors are the subjects and objects of analysis at the meso level: what strategies they pursue, how they identify development challenges, what partnerships they establish with recipients and other donors. Debates about donors may focus on the challenges of aid harmonization and coordination, or the dilemmas of relationships with recipients (my own paper in DPR deals with these issues); they may look at how different aid donors interact within a single recipient country; and what patterns of assistance emerge over decades of interaction and negotiation (like the “ritual dances of reform” explored by Tom Callaghy and Nic van de Walle). But the minute one dares to open the black box of donor agencies one risks getting sucked into the micro level of analysis, which is much more focused on the challenges of project implementation and disbursement in complex environments. Debates at the micro level tend to deal with the tactics of development assistance, where various voices have emerged recently with various models and cautionary tales: the Africa Power and Politics Programme‘s collective action model; the Blair Governance Initiative‘s focus on central executive units; or Matt Andrews‘s seemingly ubiquitous problem-driven iterative adaptation approach. Micro-level arguments usually address the sources of project failure, positing alternative models for aid effectiveness; one way or another, they make claims about project design and management at a level way below that of donor strategies, much less aid flows. Most aid research takes place at the macro level of analysis because it is relatively easy to study: all we need is aggregate date of the sort compiled by the OECD or the World Bank, and a statistical software suite. The meso level of analysis, in contrast, is usually the realm of qualitative case comparisons: the number of significant donors per country is usually small, and even the sum total of OECD donors is not large enough for robust statistical analysis. This type of work requires intimate knowledge of the strategies and bureaucratic structures of individual donor agencies and missions, as well as the political environment that they face both at home and abroad. Studies shed light on the types of strategies that may succeed in different countries contexts, as well as the ability or inability of specific donors to adopt such strategies. Aid as a strategy is a concept for policy-minded researchers who still look at the world through conventional analytical lenses, in particular those that demand homogeneous actors. Finally, project level-research has the feel of ethnography to it: it can illuminate and expose the inner workings of aid programs, which enhances empirical validity at the expense of generalizability and parsimony. There is an added complication here in that project-level research is usually immune from academic peer-review, dominated as it is by restricted agency evaluations and consultancy reports. By definition, research at one level of analysis cannot directly speak to another level: aggregate inflows rarely provide insight into specific donor data points, whereas project lessons cannot often be generalized beyond a country mission. One could imagine a way in which a development agency could take findings from all three levels and combine them into a reform process reconciling aggregate impact, country strategy, and project management; but that requires a level of bureaucratic coherence and time-consistency that is seldom present in donors. It is the realm of advocacy and public debate where the three levels of analysis tend to interact with each other more closely, even if cross-level conversations tend to obscure and confound more than resolve and enlighten. The elephant in the room here is macro-level data: even when research can establish statistically significant correlations, there is no single worldwide aid organization that can adjust the mean of its activities accordingly. It is easy to say that aid does or does not foster growth on average, but much harder to tell a specific donor whether they are on the regression line or they are an outlier, and how to get from one to the other. Aid as a resource is a concept for intellectual exercises and ethical advocacy, but it does not tell us much in practice. Nevertheless, it can easily dominate superficial public debates on aid expenditures, and so generate an undue pressure on donor agencies to adapt their country strategies and project management approaches. At the lowest level of aggregation, micro-findings about project success and failure also tend to be blown out of proportion by interested parties: aid professionals themselves have an incentive to over-report success, whereas aid detractors find in project evaluations ample fodder for simplistic criticism. At best, micro-level advocacy can drive aid effectiveness by swaying the minds of managers, specialists, and local counterparts. At worst, it can mislead the aid community by supplying a tactical miracle cure for what are essentially strategic problems (Nick Manning has written about this recently on World Bank and ESID blogs). With the two extremes prone to misinterpretation by aid proponents and detractors, where does that leave aid as a strategy? In principle, the meso level of analysis is more suited than the macro one to practical implications (assuming research alone could sway the strategies of entire donor agencies), in terms of recipient country selection, sector targeting, and relationships with other donors. However, this more bureaucratic -and even diplomatic- kind of debate attracts only sporadic attention from the public, who are likely to fixate on specific scandals while remaining blissfully ignorant of everyday mediocrity. There is no silver bullet in development assistance. Numbers do sometimes lie. Donor agencies rarely -if ever- behave in a rational fashion. And project implementation is an idiosyncratic exercise in firefighting and improvisation. But that does not mean that aid cannot do good: it just means that it’s really hard to determine all the forms of impact that aid can have. Polemics are inevitable; but they can be smart polemics, well-informed and hyper-aware of what level of analysis they address. That means we in the aid community -as practitioners, researchers or commentators- need to be extra careful about how we express ourselves, and extra vigilant for biased implications and non sequiturs derived from the wrong kind of data. Aggregate resource claims tell us nothing about specific interventions. Project tactics cannot be a panacea for overall aid effectiveness. And donor strategies cannot rely exclusively on bureaucratic considerations. What comes after all the shouting about politics and aid?